One of the more fascinating concepts Doctor Who occasionally explores is how an ordinary or trivial activity can take on profound and almost spiritual importance as generations in continued isolation persevere. ‘The Whispering Forest’ offers another take on this story, the citizens of Purity Bay upon the planet Cherdor believing that physical purity and cleanliness lead to spiritual purity and cleanliness and thus scrubbing themselves raw to rid themselves of dirt and potential infection. Within the confines of this rather fascinating backdrop, writer Stephen Cole explores a community filled with political strife as the young Sister Seska takes on the leadership role while needing to be wary of her stepmother’s own intentions. With Seska’s father having recently passed away, there is a deep void in the community that both the open-minded Seska and the more zealous Mertil seek to fill. When the Fifth Doctor, Nyssa, Tegan, and Turlough arrive, they soon find themselves intimately and dangerously involved within these politics while also discovering the more hidden realities of the Takers and the Shades who make the forest whisper. With the older Nyssa rejoining the TARDIS, it’s a nice touch to have the Doctor seeking out potential cases of Rictus syndrome. While the nod to ‘The Face of Evil’ is undeniable with this medical team slowly turning its profession into a religion, the revelation of the revenant Shades is rather unique though only variably satisfying because of the pseudo explanations given. The Shades are forty-four ancestors of the members of Purity Bay who were suspected of contracting Rictus syndrome and then euthanized. As a wave of intradimensional energy washed over their bodies during burning, they somehow became living ghostlike beings who seek to contact the living people. Unfortunately, the majority of ‘The Whispering Forest’ is simply average at best, not taking risks to set itself apart from its peers. The four-person TARDIS team is a tricky notion to adequately capture while giving everyone enough to do, especially in the shorter four-part stories of the Fifth Doctor’s era than in the often longer stories of the First Doctor’s. Here Cole tries to circumnavigate this issue by having Nyssa and Turlough wandering through the forest which, though effective in making sure they stay relevant to the story especially as Turlough tackles the Takers, also means that they occasionally end up retreading and revisiting plot points that other characters have already discovered and discussed. At the same time, the people of Purity Bay are not fleshed out and given any meaningful degree of characterization. Mertil is perhaps the most egregious example even as an explanation for her anger is offered, but the civilization as a whole is a very quarrelsome one that seems content to just stand and argue, changing viewpoints almost arbitrarily as events progress. 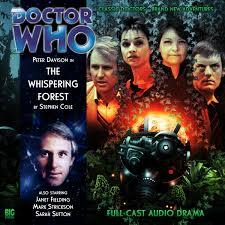 In the end, ‘The Whispering Forest’ is a perfectly competent if very traditional piece of Doctor Who that fits in with its intended era seamlessly. The core conceit of the Shades doesn’t quite work as intended and the citizens of Purity Bay aren’t the most believable, but the lead-in to ‘The Cradle of the Snake’ as the Takers learn a hidden truth about Tegan is an undeniably strong and exciting ending.